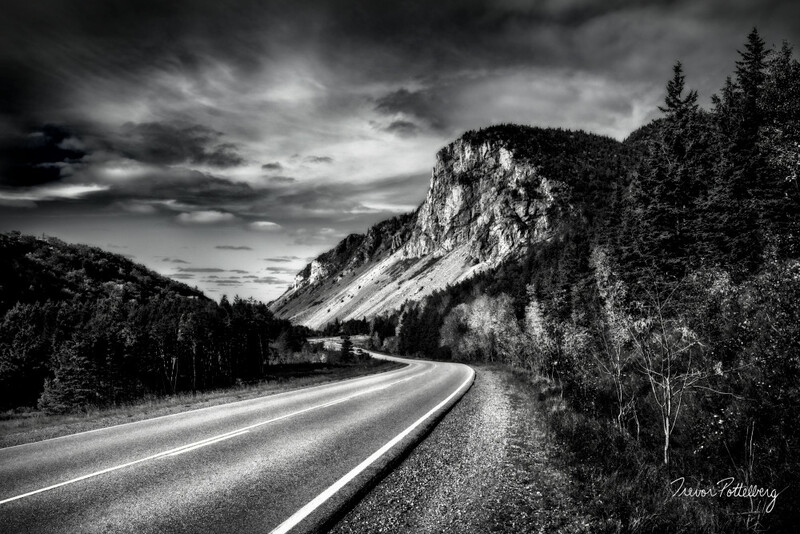 "La Grande Falaise" - by Trevor Pottelberg, features a stretch of the Cabot Trail in Cape Breton Highlands National Park, leading toward a massive towering cliff face named "The Great Cliff". This impressive structure is part of an escarpment running from La Grande Falaise southward beyond Chéticamp. When you view this artwork at a larger size, you can see a small car on the roadway below the cliff which gives you a real sense of scale. Photographed near Chéticamp, Nova Scotia, Canada.